The clade Eosauropterygia includes all sauropterygians excluding the placodonts. The placodonts are considered to be the most basal (‘primitive’) members of the clade Sauropterygia. The term ‘basal sauropterygian’ is often applied to non-plesiosaurian sauropterygians. 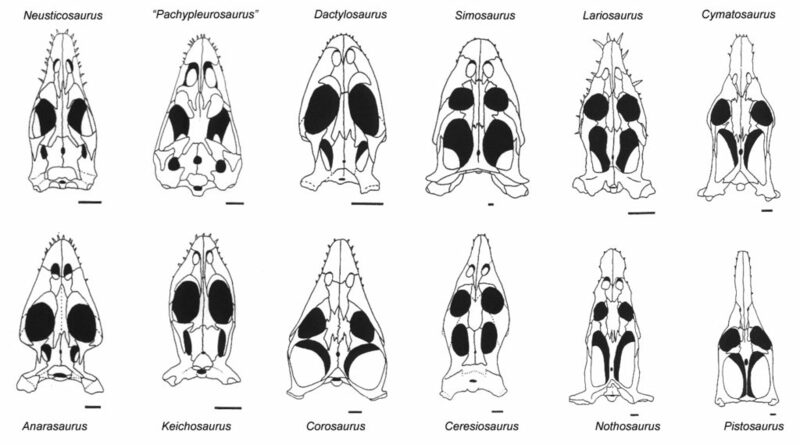 Skulls of basal Eosauropterygians in dorsal view (Compiled and modified from Storrs 1993). Scale = 1cm.